2019 marks the 13th year of BioOhio’s Ohio Bioscience Career Fairs. This year BioOhio held career fairs in February in central and southwest Ohio. These events are designed to match job seekers with Ohio’s growing bioscience organizations, featuring top employers in the biotech, pharmaceutical, R&D, and medical device industries. Attendees include recent and soon-to-be graduates as well as experienced individuals looking for new career paths. Attending the Ohio Bioscience Career Fairs is free for job seekers. Click here to download the Exhibitor Booklet! Visit the links below for examples of employers that have participated in previous Ohio Bioscience Career Fairs. Job hunting can be stressful, and in many cases overwhelming. 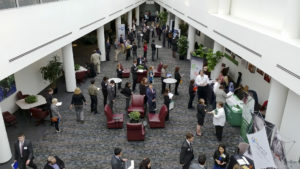 Click here for some top tips to get the most of your visit to the Ohio Bioscience Career Fairs.